4) Choose the attribute tab. Specify short desc for badi.. and specify the type: multiple use. 6) Specify interface name: ZIF_EX_BADI_SPFLI and save. 7) Double click on interface name to start class builder. specify a method name (name, level, desc). 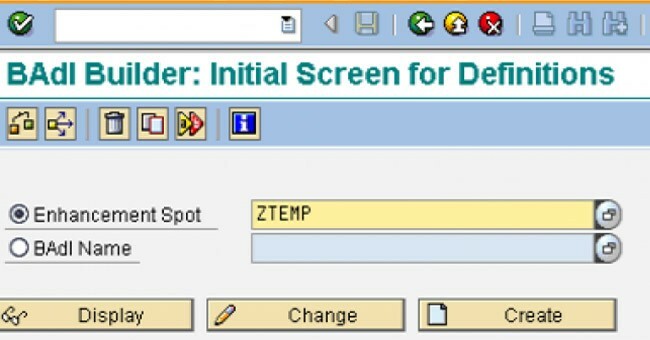 8) place the cursor on the method name desc its parameters to define the interface. 1) EXECUTE tcode se18.choose menuitem create from the implementation menubar. 4) Choose interface tab. System proposes a name fo the implementation class. ZCL_IM_IMLINESEL which is already generated. 6) Double click on method to insert code..(check the code in “AAA”). 7) Save , check and activate the code. Now write a sample program to use this badi method..
Look for “BBB” sample program. it_flights type table of sflight. write:/ 'Flight info of:', i_carrid, i_connid. loop at it_flights into wa_flights. it_spfli type table of spfli with key carrid connid. *Initialise the object of the interface. exit_ref1 type ref to ZIF_EX_BADISPFLI1. loop at it_spfli into wa_spfli. check not wa_spfli-carrid is initial. Get More Questions and Answers with Explanation at SAP ABAP Forums. How the standard BADIs are called from the standard code? Suppose there is a BADI for transaction code VA01. I have decided to use BADI instead of an user exit. How this can be achieved? I am clear of definition and implementation of BADI. it was very usefull example . "the type exit_ref1 cannot be converted into exit_ref." why its getting like that. My understanding is that a BADI is the object oriented version of a User Exit. User exits are placed in SAP's code so that a customer can customize some of the functionality without making modifications to objects that fall in the SAP name space. 1) Why do you need a BADI in a Z program???? Can't you just modify the program. 2) Can you show us an example of using SAP provided BADIs? 3) Adding code the SAP BADI's is easy. How would you modify screens in ENJOY transactions like ME51N using BADIs like adding a new tab (screen) or a button on the task bar? I have been trying to find examples for this on the net and I must say the literature available on the net is inadequate to say the least. Can any one define BADI in Functional language about the BADI, I know this is used for enhancement of SAP functionality. but can any one provide more info about what type of enhancements can be achieved and its limitation. I can execute this BADI example. Bur I have one doubt. I think the same thing we can do without using BADI. Can u tell me what is the use of BADI here in the above example.